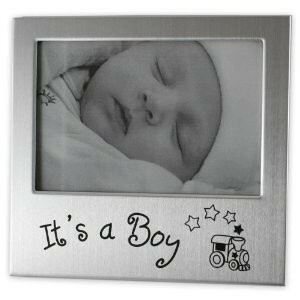 Brushed Silver Boy Photo Frame is a very cute photo frame in brushed silver coloured metal. These make ideal gifts for all the family and friends to put a photograph of the special new arrival into. The frame is 13cm x 9cm and arrives in a presentation box. It has the words It's a Boy with a little train below the space for your photograph.